A few weeks ago I was in the Philadelphia airport shuttle, pressed up against a man my age who was wearing a striped scarf and a newsboy hat. Sprinting through the terminal and the cold turned his perfectly round cheeks the color of a Red Hot melting in a cup of cocoa. He made lap after lap around his lips with cherry Chapstick and we shared abbreviated life stories as the shuttle crunched slowly through too much snow. When the doors opened and we peeled ourselves off each other, he said sincerely, "I'm happy for you!" I replied, beaming,"I'm happy for me too!" and resumed the foot-race to the next gate. Now back home, I'm still thinking about those words. Things are still, for once. Perhaps the quiet before the storm. Or the pause of passing through Neutral between Reverse and Drive. I thought I'd be distraught by the uncertainty of the next few months, but instead, being in limbo has frozen time and made me content with very simple things. I've been walking to work in the sunshine, stopping under the ornamental plum trees that have exploded in blossom to share the bees' excitement. I've been jumping rope with the 2nd graders and congratulating myself for jumping enough of the rhyme to earn a boyfriend named Franklin (while the children make it to Xavier, Yves, and Zach). I've been reading novels with no trace of guilt. Things will unfold as they will. These cookies are simple. 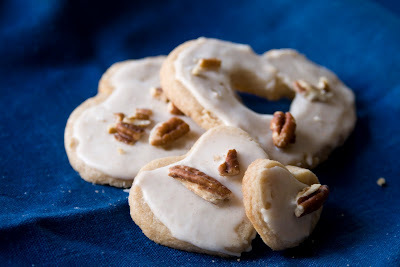 I was thinking I should post something complex and fanciful to make up for my time off, but at the request of Siobhan, here is a recipe for subtly maple-y butter cookies. Sometimes I have to remind myself to stop searching for novelty and not overlook plain old butter cookies. Cream butter and sugars with an electric mixer until light and fluffy. Mix in maple syrup, egg yolk, and vanilla. With a wooden spoon, mix in flour, salt and cinnamon until combined. Refrigerate 2 hours or overnight. Preheat oven to 350°. Line baking sheet with parchment and lightly butter or spray. On a floured surface or between parchment layers, roll out dough to 1/8" thickness. Cut into shapes with floured cookie cutters. What is it with heart-shaped baking implements? I apparently attract them. Alternately, you can roll the dough into a log before refrigerating, and then cut into 1/8" slices. But a round is just not as interesting to eat as a shape. Bake for about 12 minutes, until edges are golden. Cool on a rack. For the icing, combine the liquids and beat in powdered sugar until the desired consistency is reached. Working on parchment or wax paper, pour or spread on the cooled cookies. Sprinkle with pecans.